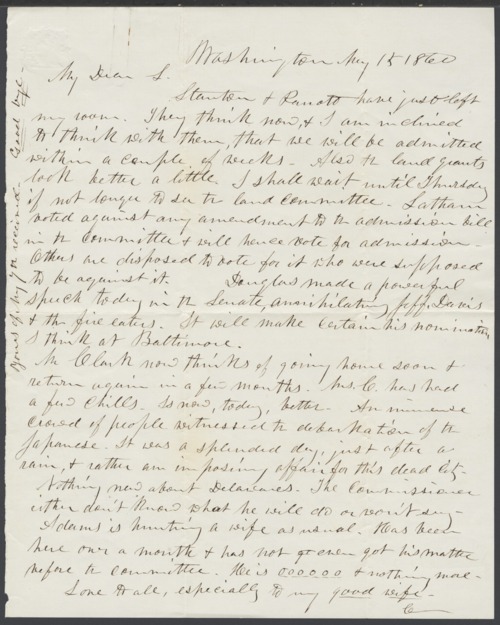 A letter written by Charles Robinson, from Washington, D.C., to his wife, Sara Tappan Doolittle Robinson. He declares that Kansas will be admitted within a couple of weeks. Robinson mentions that Douglas made a powerful speech in the Senate annihilating Jefferson Davis. A searchable, full-text version of this letter is available by clicking "Text Version" below.